All 18 Plow and Hearth promo codes have been verified and tested today! So you found something you love and now it’s time to order? Here’s what you need to know about shipping. 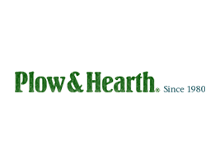 Plow & Hearth ships most in-stock merchandise within 24 hours of receiving your order. Standard shipping and handling charges cover most orders. However, some heavy or oversized items may require extra shipping costs. Shipping and handling rates vary depending on the price of your order. For more information, visit the Plow & Hearth website, scroll down to the bottom of the page and select Shipping & Delivery. Choose express shipping for just an additional $8.99 on orders up to $250. Your order will arrive on the second business day. For select furniture pieces, Plow & Hearth even offers white glove delivery where the piece is delivered to the room of your choosing. Purchase a Plow & Hearth gift card and brighten someone’s day. Gift card purchases ranging from $5 to $200 can be made, suiting anyone’s budget. Plow & Hearth gift cards can be purchased online via retail stores, or by calling customer service at 800-627-1712. The best part? Plow & Hearth gift cards never expire so there’s no rush—family and friends can take all the time they need to make the perfect choice. Gift cards can be applied to any order online, on the phone, or in store, but cannot be used to purchase more gift cards. One of the best ways to save money is to shop the clearance section. If you have a Plow & Hearth coupon code, you can sometimes attach it onto the sale price and further your savings. The sale section offers a wide variety of products and can even be categorized by price and availability so you don’t miss out. So go ahead, find a Plow & Hearth coupon code and find some awesome products. Be sure to visit the Plow & Hearth website regularly for seasonal deals and discounts. Although Plow & Hearth often has automatically applied sales, occasionally the store will also provide a Plow & Hearth promo code for customers. Make sure to keep to your eyes open for a Plow & Hearth promo code on the homepage! Sign up for email updates and get in on a $10 Plow & Hearth coupon. Not only will you receive great deals, but you’ll also get updates on the latest product previews and current promotions. No Plow & Hearth promo code necessary—simply enter in your email and start saving! Please note: this offer is only applicable for new email subscribers. If, for any reason, you are not 100% satisfied with your purchase, go ahead and return it for exchange or refund within 90 days. If your item is defective, you have one year from the purchase date to return it. Plow & Hearth wants to ensure you are thrilled with each and every purchase. Fast exchange – for the quickest service, call customer service and request a fast exchange your new order will be immediately placed and your credit card will be charged. Your replacement item usually ships the next day and Plow & Hearth will pay the shipping and handling. Returns or exchanges by mail – Complete the return and exchange form found on your packing slip. If you are returning an item that is defective or damaged, Plow & Hearth will not charge you for return shipping. Please note that personalized items cannot be returned. Need assistance? The Plow & Hearth team is happy to answer any comments or concerns you may have. Whether it’s an issue with a payment, product, return, Plow & Hearth code, shipping option, etc. Plow & Hearth is there to help. To reach out, you can either call 1-800-494-7544 from 8:00 am to 10:00 pm Monday-Saturday or simply visit the Plow & Hearth contact page and fill out an inquiry. To get to the customer service page, visit the Plow & Hearth homepage and scroll to the bottom of the page where it reads “ Customer Service.” A customer associate will respond as soon as possible. Plow & Hearth features top rated products on the website’s main menu. Top rated means that these products are customer favorites. Not convinced? There is even a shop by product rating filter offered to ensure your product is high quality. The best part? Several of these products are on sale, which means more savings for you even if you don’t have a Plow & Hearth coupon. If you do have a coupon, you can double your savings by combining it on top of the sale price (depending on the specific coupon). So what are you waiting for? Start shopping top rated Plow & Hearth products; you won’t be disappointed!